Native Southerners lived in vibrant societies, rich in tradition and cultural sophistication, for thousands of years before the arrival of European colonization in the sixteenth and seventeenth centuries. Over the ensuing centuries, Native Southerners adapted to the presence of Europeans, endeavouring to incorporate them into their social, cultural, and economic structures. However, by the end of the American Revolutionary War, Indigenous communities in the American South found themselves fighting for their survival. This collection chronicles those fights, revealing how Native Southerners grappled with colonial legal and political pressure; discussing how Indigenous leaders navigated the politics of forced removal; and showing the enduring strength of Native Americans who evaded removal and remained in the South to rebuild communities during the latter half of the nineteenth century. This book was originally published as a special issue of American Nineteenth Century History. Black intellectualism has been misunderstood by the American public and by scholars for generations. Historically maligned by their peers and by the lay public as inauthentic or illegitimate, black intellectuals have found their work misused, ignored, or discarded. Black intellectuals have also been reductively placed into one or two main categories: they are usually deemed liberal or, less frequently, as conservative. The contributors to this volume explore several prominent intellectuals, from left-leaning leaders such as W. E. B. Du Bois to conservative intellectuals like Thomas Sowell, from well-known black feminists such as Patricia Hill Collins to Marxists like Claudia Jones, to underscore the variety of black intellectual thought in the United States. Contributors also situate the development of the lines of black intellectual thought within the broader history from which these trends emerged. The result gathers essays that offer entry into a host of rich intellectual traditions. "In this timely new collection, editors Brian D. Behnken, Gregory D. Smithers, and Simon Wendt have assembled a group of stellar essays that highlight the range and complexities of black intellectual thought in the United States. Drawing insights from several academic fields of inquiry including critical race theory and feminist theory, this volume is a necessary text for anyone interested in understanding black intellectual history." 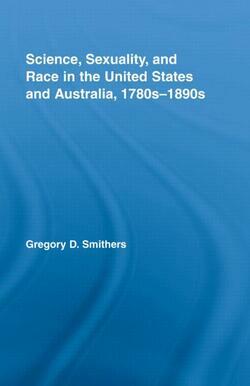 Science, Sexuality, and Race in the United States and Australia, 1780–1940, Revised Edition is a sociohistorical tour de force that examines the entwined formation of racial theory and sexual constructs within settler colonialism in the United States and Australia from the Age of Revolution to the Great Depression. Gregory D. Smithers historicizes the dissemination and application of scientific and social-scientific ideas within the process of nation building in two countries with large Indigenous populations and shows how intellectual constructs of race and sexuality were mobilized to subdue Aboriginal peoples. Building on the comparative settler-colonial and imperial histories that appeared after the book’s original publication, this completely revised edition includes two new chapters. In this singular contribution to the study of transnational and comparative settler colonialism, Smithers expands on recent scholarship to illuminate both the subject of the scientific study of race and sexuality and the national and interrelated histories of the United States and Australia. Barack Obama’s inauguration as the first African American president of the United States has caused many commentators to conclude that America has entered a postracial age. The Preacher and the Politician argues otherwise, reminding us that, far from inevitable, Obama’s nomination was nearly derailed by his relationship with Jeremiah Wright, the outspoken former pastor of Trinity United Church of Christ on the South Side of Chicago. The media storm surrounding Wright’s sermons, the historians Clarence E. Walker and Gregory D. Smithers suggest, reveals that America’s fraught racial past is very much with us, only slightly less obvious. With meticulous research and insightful analysis, Walker and Smithers take us back to the Democratic primary season of 2008, viewing the controversy surrounding Wright in the context of enduring religious, political, and racial dynamics in American history. In the process they expose how the persistence of institutional racism, and racial stereotypes, became a significant hurdle for Obama in his quest for the presidency. The authors situate Wright's preaching in African American religious traditions dating back to the eighteenth century, but they also place his sermons in a broader prophetic strain of Protestantism that transcends racial categories. This latter connection was consistently missed or ignored by pundits on the right and the left who sought to paint the story in simplistic, and racially defined, terms. Obama’s connection with Wright gave rise to criticism that, according to Walker and Smithers, sits squarely in the American political tradition, where certain words are meant to incite racial fear, in the case of Obama with charges that the candidate was unpatriotic, a Marxist, a Black Nationalist, or a Muslim. Once Obama became the Democratic nominee, the day of his election still saw ballot measures rejecting affirmative action and undermining the civil rights of other groups. The Preacher and the Politician is a concise and timely study that reminds us of the need to continue to confront the legacy of racism even as we celebrate advances in racial equality and opportunity. The Preacher and the Politician is a timely and provocative book. Clearly written in accessible language, it offers general readers and specialists alike a means to understand the context of the 2008 election and the pervasive complexities of America's legacy of race and racism. "A masterful example of how comparative and transnational methodologies can provide new and exciting insights into the intricate racial discourses that accompanied the colonisation of indigenous peoples in the United States and Australia. This book deepens our understanding of how white Australian and American identities were inextricably linked their nation’s settler origins." "Gregory Smithers has given us a most welcome addition to the international study of white settler societies - a field of growing importance. He skillfully weaves together his chosen themes of science, sexuality and race into a cogent and compelling narrative studded with graphic illustration and telling quotation. It is a significant achievement which should attract both the expert and the curious general reader." "His innovative approach combining a trans-national perspective with a detailed comparative analysis is praiseworthy and provides for a compelling multi-layered narrative."